I chose to make two items for the blog challenge. The first was a rose syrup drink. I have memories of this since ever. It's a drink that we usually make during Ramadan- our month of fasting. After a day of no food and water, this drink is especially refreshing. It's extremely simple to make. This rose syrup is like a cordial. 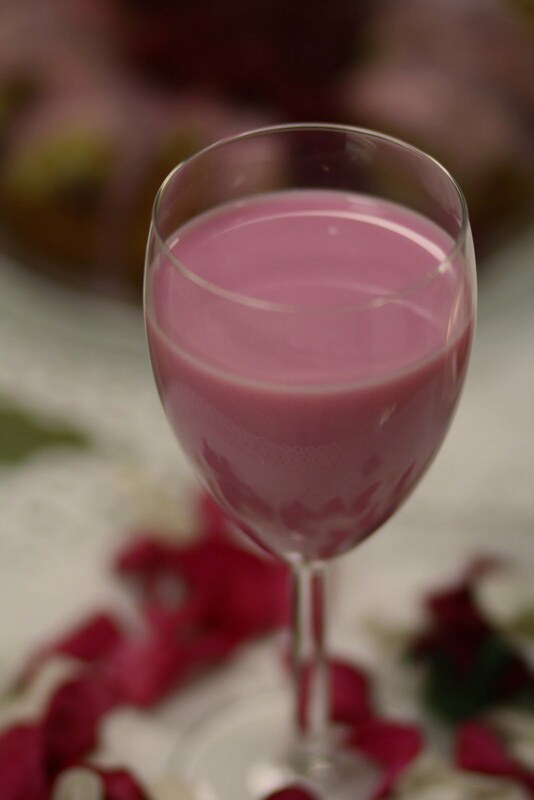 You add four-five parts milk to one part rose syrup. And make sure to stir really well. Recently, we've taken a twist on this and started adding water to the rose syrup. If I'm not mistaken, rose syrup is a South Asian/Persian ingredient and is drunk primarily countries around that region. The second thing I chose to make was a cherry cake. I've made this cake only once before- and to amazing reviews! Preheat oven to moderate 180C. Grease a 20cm ring cake tin. Dust with flour and shake off any excess. Rinse and dry the glace cherries and cut each in half. Toss them in a little of the flour. Cream the butter and sugar in a small bowl with electric beaters until light and fluffy. Add the eggs gradually, beating thoroughly after each addition. Beat in the vanilla. Transfer to a large bowl. Using a large metal spoon, fold in the sifted flours alternately with the milk. Stir in the cherries. Spoon the tin and smooth the surface. 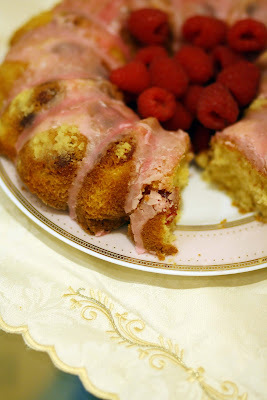 Bake for 35 minutes or until a skewer comes out clean when inserted into centre of cake. Leave in tin for 10 minutes before turning out onto wire rack to cool. For the icing, combine the sifted icing sugar, butter, and 1-2 tablespoons water in a small heatproof bowl. Stand the bowl over a saucepan of simmering water, ensuring the base doesn't touch the water. Stir the mixture until the butter has melted and the icing is glossy and smooth. Stir in a couple of drops of food colouring. Drizzle over the cake. 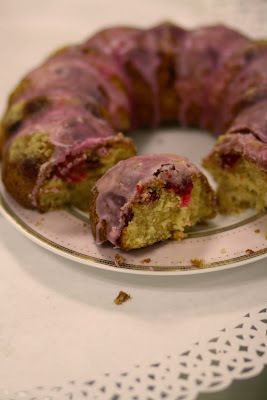 Fill the centre of cake with raspberries. Serve with toffee syrup, if desired. Me too. I love pink and these days I especially love styling with pink and white! Hey the rose syrup drink you mention is a staple at our place for celebrations. That looks like a very sticky and tempting cake, I like how the icing rolls over the edge. Thanks for submitting to the Monthly Mingle! 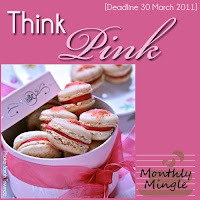 Pink is my fav too...Awesome recipe.. cute clicks too..